Find hotel near Central State Museum Of T .. The Central State Museum of Kazakhstan was established towards the beginning of 1930’s and the current building in which the Museum has been housed dates back to 1985. Being Central Asia’s one of the biggest Museums, it consists of exhibits and innumerable fascinating collection of Kazakh archaeological, modern cultural, historical, and political artefacts. There is a total of seven halls and each one of them consists of displays that portray the history. The extensive collection at Central State Museum of Kazakhstan describes the country’s history which is over a thousand years old. How popular is Central State Museum Of The Republic Of Kazakhstan? People normally club together Zoopark Almaty Zoo and Sapphire while planning their visit to Central State Museum Of The Republic Of Kazakhstan. Huge building, interesting from the architectural point of view. Museum itself has exhibitions on prehistory, a bit on stone and iron age, something on nomad tribes etc. I found the part on ethnic minorities in Kazakhstan very interesting. Museum could do with some refurbishing, it could be more interactive. Enormous stylish building with interesting spaces to fill yet it looks like a High school end of the year science-history fair. This Museum is so badly curated !!! The information in English, French or German are whimsical. 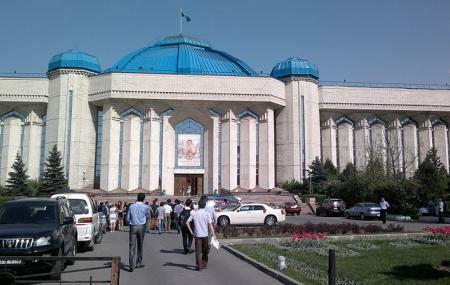 This Museum is a pale echo to the one in Nursultan (Astana). The reward to go there is located on the 2nd floor with bits and bobs on the Soviet era spacial program and, possibly, one if the 3 Sputnik prototype... no information available!!! The Museum shop is unbelievably lame. Don't forget to pay for additional ticket to get access to the protected room for the museum's gold and jewelry collection. It costs 1300 Tenge on top of the regular entry fee. You can ask for a guide who speaks English and several other languages. No photo and video is allowed in here. There are very interesting and extremly fine handmade gold aertifact and precious stone on display. Has lots of exhibits in 4 large halls. Some are more interesting than others but well worth a stop. The building is impressive and located in a lovely park. The museum itself is okay, there are a few nice objects but nothing that will blow your mind. Mostly recreations rather than actual archeological artifacts. There was a very charming series of dioramas about the various ethnic groups living in Kazakhstan. Go if you have the time, but don’t worry about missing it, if coming here strains your itinerary.